KILLWHEEL! is a game about fabulous prizes. It's similar to spin-the-bottle. 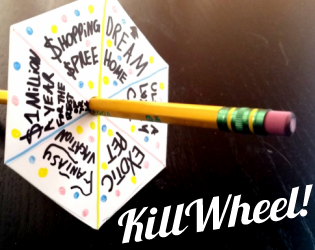 Print out the rules, cut out the Wheel, and follow the instructions to build a spinner. Contestants spin the Wheel to find out what they've won - then explain how it causes their demise. It's the opportunity of a lifetime! KILLWHEEL! is a Sorry Not Sorry Game.